Fragrant. 4 to 6 Feet. July flowering. We believe this to be the very BEST hybrid not only ever created by Washington State hybridizer, Mr. LeVern Friemann, but of all time, anywhere in the world. Deep maroon-red color front and back, blending to bright violet on petal/sepal tips. A unique chocolate nectary star when grown in light shade; it changes to olive-green in full sun or as the bloom ages. Chocolate nectary is from the 'Journey's End' parent. Black-tipped, raised papillae, and a sweet, lingering fragrance. Blooms are very sun fast, a fantastic addition to the lily world, and certainly the reddest Tetraploid Oriental lily ever to be released. Grows 5 to 6 feet tall in full sun for us, expect taller stems under glass, or in light shade. August Flowering. 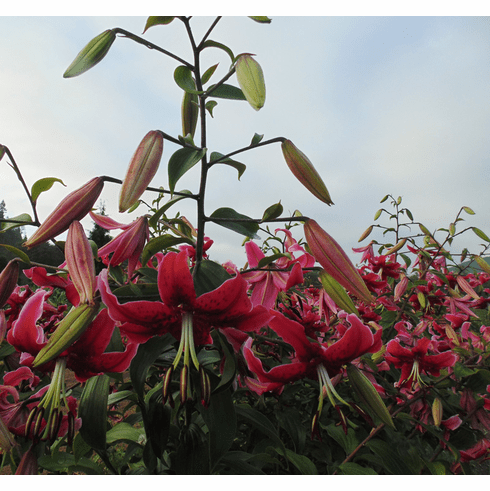 Editorial Note: The practice of taking a known lily, putting it into tissue culture, and then releasing it under a new name as breeder unknown though not commonplace, does happen. The first thing that came to mind when we saw Miss Feya was its remarkable resemblance to our spring 1999 introduction LeVern Friemann, one of the first solid red Orienpet lilies to be offered the garden public. B&D Lilies made the original LeVern Friemann selection back in the summer of 1992, brought about by crossing his Tetraploid Journeys End conversion with a tetraploid conversion of Dr. Raphael Pappos lily Rachel Pappo (a hybrid of Imperial Crimson and Black Beauty) given him by Dr. Pappo for breeding. The bulb was scaled that fall by LeVern, along with his yet unnamed Katherine Walton, named by LeVern in honor of his sister-in-law, and Marion Friemann named by us in honor of LeVerns wonderful wife. Also scaled at that time were the yet unnamed Black Beauty hybrids Scheherazade, Juan de Fuca and Northwest Passage from selections he made several years earlier. The resulting bulblets from those scales were moved to our Port Townsend field in the spring of 1994 for propagation. Already in production were his Tetraploid asiatic Apricot Supreme and his pollen fertile LF-1, bred from the Aurelian hybrid Thunderbolt and Tetraploid Rachael Pappo. First introduction of the lily LeVern Friemann was in the spring of 1999, just a year before LeVerns passing. At $80.00 each, the price LeVern requested, his lily was a complete sell out with sufficient back orders for fall delivery that it was removed from our offering in the fall 1999 catalog. Slow to propagate, LeVern Friemann was never offered in large quantities. Eventually though it appears to have made its way to a tissue culture lab in Holland and renamed. After noting the strong resemblance of Miss Freya to 'LeVern Friemann', we purchased several cases of planting stock. In growing LeVern Friemann side by side with Miss Freya we see no difference and must assume they are one and the same and offer them here as LeVern Frieman until someone proves they are indeed different. The plus side of all this is that LeVern Friemann is now at least into mass propagation, something we never did, making it available at a price for customers who might be on a tight garden budget. In 1999, LeVern Friemann was cutting edge genetic material for breeders and arguably the finest garden lily of its time, and still is one of the finest to this day. Also at that time, the greatest value laid in its genetic make up and the fact it was a fertile breeder, rare for an Orienpet in those days. This truly is a must have lily for the garden. One of the frustrating things for us is that others in the trade know of the name situation, but just shrug it off. We find the attitude of a sale is a sale, accuracy does not matter a great disappointment in our industry, but then we do not just buy and sell as they do, just processing widgets so to speak, we are growers. B & D Lilies, is entering our 41st year of commercial propagation of lilies in the fall of 2018, this is a labor of love that includes trying to keep the records straight. For those who are interested, a bit of background on LeVern the man. LeVern was a wonderful man and we treasured his friendship and advice. His greatest sin was that he totally trusted everyone and some of those people took great advantage of that trust. One set of visitors from Canada comes to mind. While dad kept LeVern busy in conversation, his son was digging around the stems of lilies with his fingers removing stem bulblets. LeVern caught him, emptied the kids pockets, and invited them to both leave. Another couple, this time from the US, while one kept LeVern busy in conversation, the other was snapping flower buds off the lilies to put into tissue culture. LeVern did not discover the missing buds until after they left. I remember the betrayal and disappointment he felt in the one he regarded as a trusted friend when relating this incident to me the following week. The sad thing was that LeVern would have freely given them what they stole or attempted to steal. They only had to ask. Dianna once expressed an interest in a large Euonymus Sachalinenis (Enoymus plainipes) that LeVern simply referred to as his Wahoo tree. It was showing thousands of the large pink/red clusters of seed capsules and could only be described as beyond beautiful. LeVern told her "just a minute", went to his tool shed and emerged with a shovel and pot. Five minutes later, she was presented with a lovely little seedling, freshly potted and ready for transport. That plant has grown to about 18 ft. tall by 12 feet wide and every fall is ablaze with color. She did not even have to ask, LeVern loved to share his garden treasures with everyone. To this day I vividly remember getting up at 5 am to catch a 6:30 am ferry ride to Whidbey Island and then the 90 plus minute drive north to Bellingham near the Canadian border. I would always arrive at his home as the sun was beginning climb over the towering fir trees to the east and south of his lily garden and then walking along side him to enjoy and greet in wonder, the opening flowers of that day. Following a couple hours in the garden, taking photos, and evaluating new seedlings, it was off to his favorite restaurant, the 'Kings Buffet' about a mile down the road, where LeVern would load up on macaroni and cheese with a salad chaser, discussing his lilies while eating. The salad was only eaten after all the Mac was gone, a routine that never varied. Under instructions by his wife Marion, each time we left for lunch, was that we were not to go for ANY dessert. Marion always had hot, straight from the oven, chocolate chip cookies on the table with two cold glasses of milk waiting for our return. An excellent cook, Marion never went to lunch with us as she was not a fan of buffet style food. After cookies, it was back to the garden to check out once again the seedlings and then head back home later that afternoon. LeVern was adamant about the use of green manure crops and always planted a portion of his garden in either oats or winter rye for working into his soil. Everything was done with a shovel and a rake, nothing was simply tilled in. He was constantly turning over his soil, working something organic into it. You could literally lie on your chest in his garden and dig your hand down until you ran out of arm. His garden was a paradise, filled with his lilies as well as selections of the wonderful rhododendrons and strawberries he had hybridized as well. A little know fact about LeVern is that it was he who created the original seed parents for the trumpets Pink Perfection, Golden Splendor and Copper King. In the early 1950s LeVern was paid a visit by Jan DeGraaff, founder of Oregon Bulb Farms, who purchased his trumpets for $100, a months salary for many people at that time. LeVern swelled with pride when he spoke of this sale knowing that Mr. DeGraaff had taken his trumpets to a marketing level and popularity in the world that he could never have achieved on his own. I once asked if he had ever wished he had held out for more. His reply was a quick and adamant NO, "Mr. DeGraaff has spread my lilies all over the world". I truly believe had LeVern known the future, he would have simply given Mr. DeGraaff the bulbs. LeVern was a county extension agent in Whatcom County and could walk into the downwind end of a field of strawberries and just from the fragrance in the wind, knew if the field required further investigation. Upon his death, we were given his lily records by his daughter. Included in this life long collection were the papers on his work treating lilies with colchicine obtained from crushed bulbs of the fall Crocus and then converting lilies to a tetraploid level with this substance attempting to increase fertility for breeding. His first works with this highly toxic and dangerous carcinogenic substance, along with those of Robert Griesbach, and Samuel Emsweller, broke the ground that today has made the popular Orienpet Lilies possible. Without the work of these men and the breakthroughs they made, the Orienpet lilies of today would still be in the dark ages. We offer this information only as a FYI for those who care (and unfortunately, most gardeners don't), but B & D Lilies is the oldest lily specialty nursery in America, we knew and were befriended by the lily breeding pioneers, and we would like to see the accurate reporting of history and breeding information.